The Moon is in Taurus until 1:39 AM. The Moon is void from 12:45 AM to 1:39 AM. 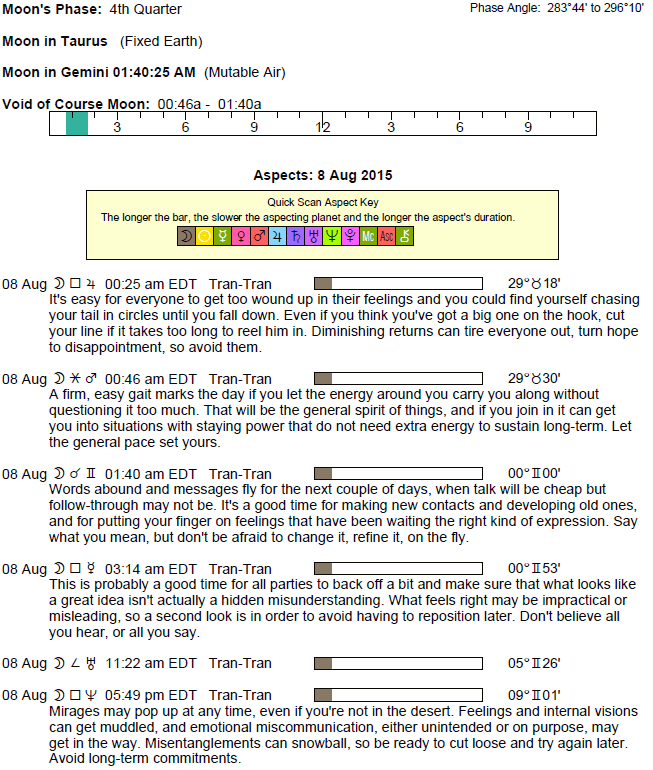 The Moon is in Gemini from 1:39 AM forward (until the Moon enters Cancer on Monday, August 10th, at 8:08 AM). 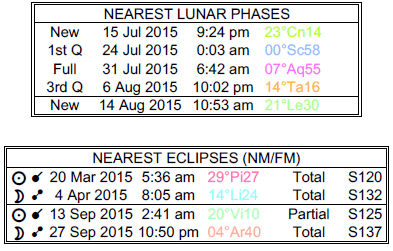 The Last Quarter Moon occurred on the 6th and the New Moon will occur on the 14th. Mercury spends its first full day in Virgo (Mercury transits Virgo from August 7-27). Mars enters Leo today (Mars transits Leo from August 8th to September 24th). The new Mars cycle that begins today brings your fiery and courageous and ruling planet into your solar fifth house until September 24th, dear Aries. It’s a period of extra dynamism, stimulation, and action, particularly in your creative, entertainment, and romantic worlds. If channeled and used well, you may have just the right amount of gumption and courage to go after who and what you want, or your heart’s desire. If misused, you could be stirring up unnecessary conflicts. This more outgoing cycle brings smoother energy to most of your endeavors, as your direct approach tends to get you results. However, with Venus retrograde here as well until September 6th, you might want to avoid coming across in a too harsh or brusque manner. The Moon’s move into your communications sector today brings a stronger need for more movement in your life, either physical or mental, or both. 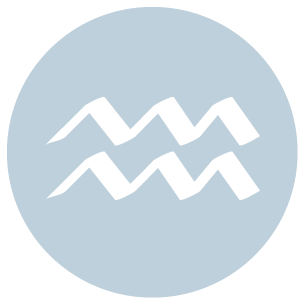 The Moon leaves your sign early today, Taurus, and enters Gemini, where it will transit until Monday morning. This turns the attention away from emotional needs and directs it to what you have and may want. It’s a time for surveying what you own and for building upon your resources if you feel the need. Mars begins a new cycle today, moving into your home and family sector where the Sun, Venus, and Jupiter are already visiting. This transit lasts all the way until September 24th, and can bring fire, courage, and the desire for action to your personal or domestic life. You could feel the motivation to handle problem areas with family or to take up projects around the home. Directing this extra energy into productive areas is critical. Otherwise, you may feel quite restless or you could stir up unnecessary conflict. You are protective of others and yourself now, but perhaps a little too defensive. 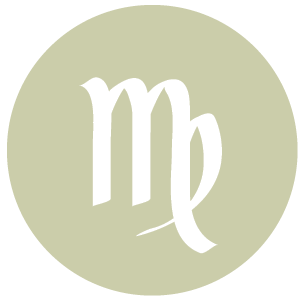 With retrograde Venus also in this sector for part of this transit, until September 6th, you should consciously avoid being too pushy or brusque with family members, however. The Moon emerges in your solar chart very early into the day, dear Gemini, moving out of your privacy sector and into your sign. Emotions that you’ve tucked away recently now demand your attention. Today, Mars begins its transit of your communications sector, where this planet of courage, assertiveness, and energy will stay until September 24th. This can be a cycle in which you become highly motivated to learn something new, or you could become especially busy in your neighborhood or your daily life. You might easily become fired up over ideas and opinions. You could gain the courage to contact someone with whom you’ve become out of touch. Pour your energy into intellectual tasks if you can, as you can get a whole lot done now, working with vigor and passion. Watch for hasty communications and transit. 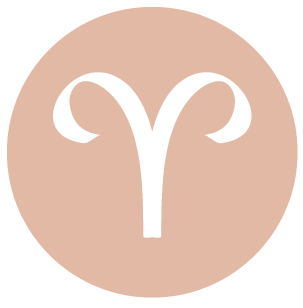 Note that with retrograde Venus in the same sector until September 6th, you may have to consciously attempt to add more warmth to your communications, as you could be more brusque than usual. 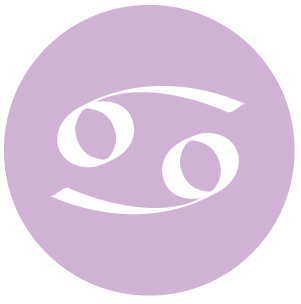 The Moon moves into your privacy sector and Mars moves out of your sign today, dear Cancer – two signs that you’re settling in a little. The Moon’s transit suggests the need for more down time, but this is only until Monday morning. Mars, however, transits your solar second house until September 24th. This transit brings more energy, courage, and initiative to your financial life or business. It can also be a time for building up your resources or putting your natural talents to good use. Pressures to action certainly subside now. Impatience and impulsiveness are leaving you, and much of your energy will be directed into business endeavors and the seeking out of material security. The drive to improve your resources is strong, but there can also be some tensions surrounding personal finances and possessions. Questions of ownership and values can be hot topics. With retrograde Venus in the same sector, it’s a good time to review your budget, but perhaps not to make a major purchase. 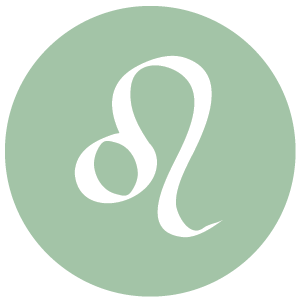 You’ve been hosting more than the usual number of planets in your sign recently, dear Leo, and while Mercury moved out of Leo yesterday, Mars moves into your sign today. Mars brings its qualities of fiery assertiveness, courage, initiative, and energy to your personality. 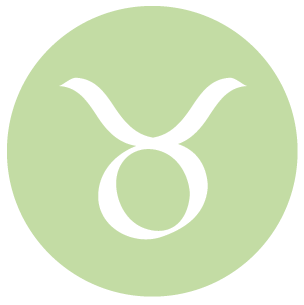 This cycle lasts until September 24th, and can stimulate strong desires to begin new projects or to present yourself in bolder, more dynamic ways. You have more energy during this cycle, sometimes to the point of excess, and you’ll be in charge of managing it properly. Pace yourself, but take action on things that matter to you most. Keep in mind, however, with retrograde Venus also in your sign for part of this period, until September 6th, you should watch that you don’t come across as too brusque or me-first. Try to express yourself with more warmth. 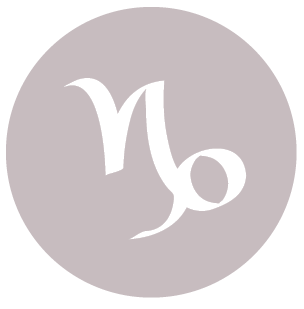 The Moon moves into your performance sector early into the day, dear Virgo, bringing your attention to what needs to get done. Until Monday morning, you’re more aware of your responsibilities and perhaps a little sensitive to criticism of what you have and haven’t done. Mars begins its transit of your soul sector today, and will transit here until September 24th. Mars has company here, with the Sun, Venus, and Jupiter already in this area of your solar chart, so that you’ve already been a little reclusive, dealing with endings or bringing a chapter of your life to a close, and sometimes quite lost in your inner and dream world. However, Mars brings quite a bit of energy and courage to these things now, and you might feel especially motivated to deal with problems that have been left outstanding or unresolved in the past, once and for all. Sometimes with this transit, if you don’t acknowledge your need for more rest, you’ll feel under the weather now. This apparent slow-down should not be considered a stroke of bad luck. In fact, it’s a time for recharging your spirit, laying to rest those plans that have had their day in the sun or the ones that have simply outgrown their usefulness. When Mars enters your sign at the end of this transit on September 24th, you are likely to experience a rebirth of energy. For now, it’s important to focus on the past and what you’ve been holding onto that is preventing you from moving forward. With Mars moving out of your responsibility and performance sector today, dear Libra, some of the competitiveness and pressures you have been feeling are likely to subside. 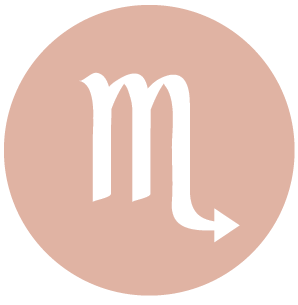 From today and until September 24th, Mars is bringing extra energy, courage, assertiveness, and fire to your sector of groups, friendships, and aspirations. You might be especially busy with activities or teamwork, and possibly the demands of others in your life. While there may be some competitive energies among friends, you can manage it better if you recognize the value of the team. In fact, competitive feelings with associates or peers can in fact motivate you to make improvements to your own projects or endeavors. You’re likely to come up with some very interesting plans for your future during this cycle. Note, however, that with retrograde Venus in the same sector for part of this cycle, until September 6th, watch that you are not overly brusque with friends or in group settings. The Moon moves into your adventure sector early today, and you are more inclined to want to get out and about or to experience and learn new things. 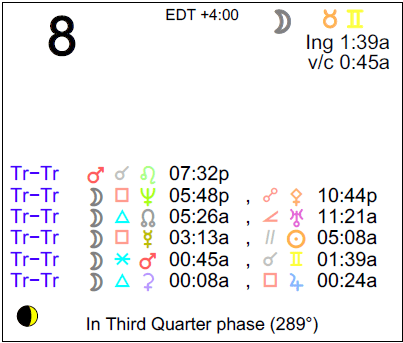 The Moon enters your solar eighth house early today, dear Scorpio, turning your attention to your own inner workings and to the hidden elements of life around you. You are more sensitive to power dynamics and more aware of your deeper feelings now. Today, you are entering a cycle that lasts until September 24th that brings high energy, some competitive feelings, and ambition to your life. Professional matters, life plan goals, public life, responsibilities to others, and business affairs are now more animated. You bring more energy and courage to these areas of your life. There can certainly be some conflicts now, particularly with those in positions of authority, but it’s also a time when you are especially motivated to excel and improve. 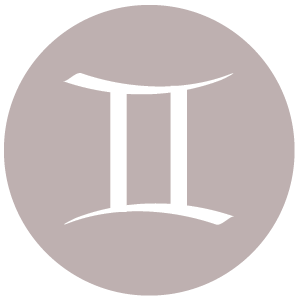 Note that with retrograde Venus in the same sector for part of this period, until September 6th, consciously add more warmth to your presentation and to your professional manner for best results. Fiery Mars enters fellow Fire sign Leo today, dear Sagittarius, and this brings smoother energy to your life and to your initiatives. Generally speaking, during this cycle until September 24th, obstacles are fewer or you know how to get around them when pursuing your desires. You can be feeling more motivated, enthusiastic, positive, and energized now. You may be attracted to new physical or mental challenges during this period. You might also find yourself especially fired up over ideas and opinions, which can of course lead to some very “lively” debates. You may take up a new interest, self-publish, or pursue a course of study. 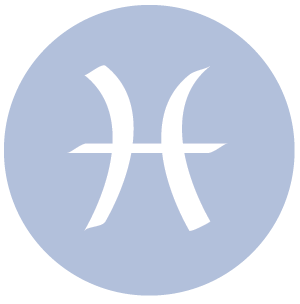 With retrograde Venus in this same sector of your chart concurrently for part of the time, until September 6th, you could become quite focused on issues from the past and attempts to correct them, particularly related to injustices. Some of you could be traveling, but it’s not an ideal time for travel with the goal of relaxing. 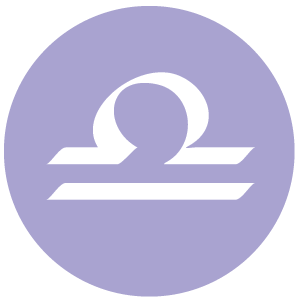 The Moon moves into your work and health sector today, dear Capricorn, and this points to more sensitivity to problem areas in your life, your routines, and details of daily life. Mars begins its transit of your solar eighth house today – an area of your chart that is currently hosting the Sun, Venus, and Jupiter. Mars now brings its active, fiery, courageous energy to intimacy matters, including your relationship with yourself and/or close partnerships. There can be more motivation to explore the deeper side of life. You can also use this period for taking actions that empower you, such as quitting bad habits or cutting out addictions. Your focus turns to strategy, power, and self-control. You are learning that power is not about having the upper hand with others. Instead, it’s about managing your own energy effectively. This cycle turns the heat up on the more intricate elements of relating, and lasts until September 24th. 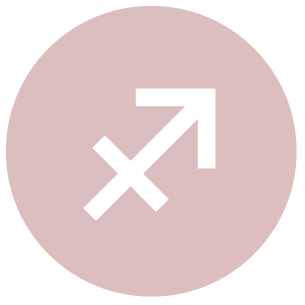 With Venus retrograde in this same sector for part of Mars’ cycle (until September 6th), it’s important to avoid being too brusque when it comes to psychological plays, power dynamics, intimate matters, or taboo topics. Avoid coming off as controlling or unforgiving. The Moon moves into a more easygoing sector of your chart today, dear Aquarius, which can certainly lighten the mood. The courageous, energetic and active qualities of Mars are now applied to partnerships, relationships, and teamwork with Mars moving into your solar seventh house today. This cycle runs until September 24th, and enlivens partnerships. You tend to attract more assertive or outgoing people into your life. You might find others energizing, or irritating, depending on your current disposition! There can be a competitive feel to relationships during this cycle. If you are meeting with hostility or assertiveness in others, consider whether you are projecting inner frustrations onto others. You could be feeling that the ball is in another’s court during this transit, but if you “own” the energy, you can harness it and use it for more courage with partnership matters – for clearing the air, for taking charge of problem areas, or for starting a new relationship. Even so, consider that Venus is retrograde during some of this transit, until September 6th, and you might want to avoid coming across too brusquely. You already have the Sun, Venus, and Jupiter in your work and health sector, dear Pisces, and now Mars joins them. Fiery, courageous, and competitive Mars enlivens this area of your solar chart until September 24th, and you are ready for action, bringing more energy to your work and/or to your health routines. If you haven’t seen real results with health programs, this might be a time to begin anew. Watch, however, for overdoing things – ease into things – because while Mars is motivating, it can also be competitive. If you are able to work independently or set your own pace, then do so now, as you can get a lot done. If you can take the lead, this can be beneficial now. The Moon moves into your sector of home and family today, however, and this can turn your attention to your personal life. You have more interest in what’s familiar just for the time being. If Your Birthday is August 8th, If Today is Your Birthday full horoscope here. Time to express your personal creativity and make an impact. Be assertive and playful, rather than arrogant. Sabian Symbol: A daughter of the american revolution. Moon 12° Scorpio 50' 46"